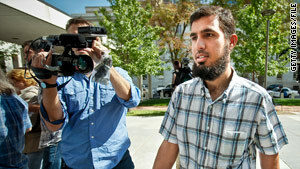 New York (CNN) -- A grand jury indicted a New York taxi driver Friday in connection with the case of Najibullah Zazi, who is accused of conspiring to use weapons of mass destruction on U.S. soil. Zarein Ahmedzay pleaded not guilty in U.S. District Court to lying to a federal agent, his attorney, Michael Marinaccio, said. Ahmedzay was arrested overnight by the FBI's Joint Terrorism Task Force along with Adis Medunjanin, a 25-year-old Bosnian immigrant. Authorities say Zazi, who has pleaded not guilty to conspiracy charges, planned to be in New York and use an explosive device on September 11, 2009. A law enforcement source told CNN that Medunjanin -- who has denied knowledge of the Zazi case -- is expected to be "indicted on a conspiracy count and receiving military training from a foreign terrorist organization." Both Medunjanin and Ahmedzay had been under surveillance, a source said. Ahmedzay, a naturalized U.S. citizen, was picked up by law officers Thursday night while driving his cab, his attorney said. Ahmedzay's sister told CNN affiliate WABC on Friday that he is "just like any other brother." Asked whether Ahmedzay had any hatred for America, his brother, Nazir Ahmedzay, told WABC that "if he did, he wouldn't be living here." The FBI executed a search warrant Thursday afternoon and confiscated Medunjanin's passport. After turning over his passport to authorities at his home, he left his house and at some point started "driving faster and faster," though authorities were not chasing him, a source said. "He hit another car in the rear and NYPD took him into custody for fleeing the scene of an accident. He was taken to the hospital and treated for minor injuries. He then talked with the FBI and members of the Joint Terrorism Task Force," another law enforcement source said. Medunjanin arrived in the United States in 1994 and became a citizen in 2002. His attorney, Robert Gottlieb, has said his client and Zazi attended the same high school and frequented the same mosque. Investigators searched Medunjanin's home, in the Whitestone neighborhood of Queens, in September, when the Zazi investigation broke. They interviewed Medunjanin, his sister and his parents then, Gottlieb said, with Medunjanin talking with police for about 14 hours. Ahmedzay also was questioned in the Zazi case.